Some people say life begins at forty. Other people say life begins at thirty. Whereas other people say life begins when you're in your twentys. And as for the rest of society, hey, they don't care about age, they just care about cosplay. Check out this interview I did with Ginger and see why. 1) What are your own origins, Ginger? It all began with a lab experiment that went terribly-terribly wrong, Haha! Just Kidding! When I was in high school I began to really dive into the whole nerdy lifestyle. I was mainly into Anime and Manga at that time. A close friend of mine told me about a convention called Animazement, and I decided to cosplay. Thus, a legend was born! I actually didn't cosplay anymore until 2014, about 5 years later, and since then I have been steadily submerging myself into the cosplay lifestyle. 2) What are the most persistent comments you’ve received from your followers? Honestly, all of my fans are always reminding me why I do what I do. I've had a few people mention that I have inspired them to give cosplaying a try and that my passion for it has really motivated them to cosplay. I cannot begin to explain how happy it makes me when someone says that I inspire them to cosplay. 3) What is your ‘regular’ job? And does it in any way shape or form aide you as a Cosplayer? I actually work as a make up artist as my 'regular' job. It's probably one of the best jobs to have when cosplaying, aside from being a seamstress or prop maker. As a cosplayer I try my hardest to really embody the character and be the character. I take a lot of time to do my make up accordingly. For instance, when I was Miss Martian from Young Justice, I had to use body paint in order to really accomplish her as a character. I would have never known the importance of contouring and highlighting if it weren't for my experience as a Make Up Artist. I think make up is something a lot of cosplayers overlook, but it really can take your cosplay to the next level. 4) How did your friends, family, and work-colleagues first react to the news that you like to cosplay? My mum gets so excited when I begin a new project. She's always asking what I'm up to and who I plan to cosplay. My co-workers really enjoy it too. I have honestly not had any bad reactions from my family or people I work with. The worst reactions come from people that I am friends with on Facebook that knew me prior to my cosplaying. A lot of them think it's weird and I've had a few people comment rudely about my hobby. 5) How do you decide what Cosplay costume to wear for a convention? And who makes them? I am a firm believer in cosplaying someone you really like and identify with. All of my cosplays are chosen because I either (1) totally love the character, or (2) totally love the design. More often than not it's a nice mixture of both things. As for who makes them, I do. Well, most of them. I know there is a sudden stigma with buying your cosplays and I have no idea why. I will both make or buy cosplays, and it all depends on if I have the time and if I think it is a cosplay I can handle making at my current skill level. Sewing is pretty easy, but those cosplays that are intricate I will either buy or commission from someone. 6) What have you learnt about yourself whilst Cosplaying? And were their any unforeseen obstacles you had to content with? Cosplay has been a HUGE confidence booster for me. It's also been a huge motivator. Last September I decided to try to get in shape for a cosplay that I've always wanted to do. The outfit isn't necessarily skimpy, but it is very form fitting. I began a weight loss journey and, since September, I've lost roughly 60lbs. I still have a ways to go before I'm at my goal but I could not be more excited about my accomplishment. 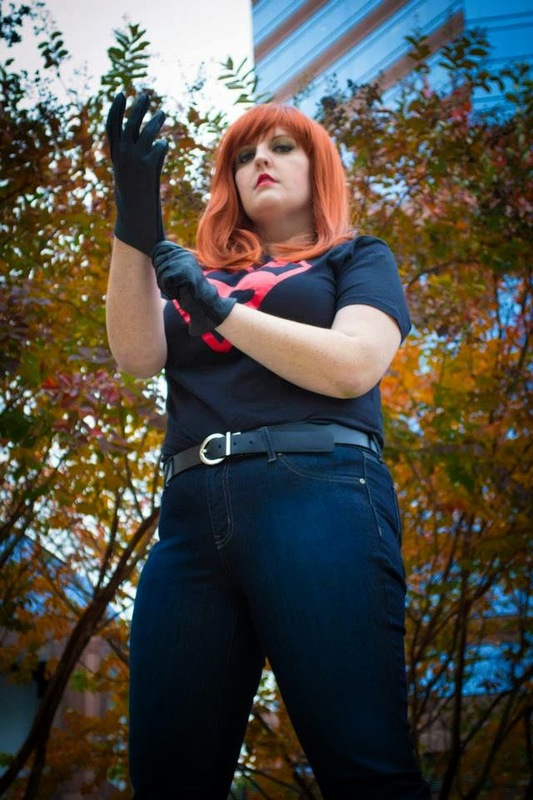 Since I've lost weight I've become more confident in myself and my cosplays. I've learned a lot about who I am as a person since I've gotten back into cosplay. 7) What was the best / worst convention you ever attended? Best convention would probably have to be NC Comicon. It was there that I debuted one of my favorite cosplays, Miss Martian, and it was there that I really began branching out and meeting people. I made so many new friends at that convention. I also entered my first costume contest, at the pushing of a few random con-goers. I didn't place, but it was a great experience and I'm so lucky to have made all the friends I did at that convention. I even got to meet a lot of my cosplay idols while I was there. As for worst convention, I can honestly say I have not been to a convention where I was so unhappy that it would qualify as the worst ever. Obviously I have my favorites, but none of the conventions have been terrible. 8) What would be your dream Cosplay gig and outfit? 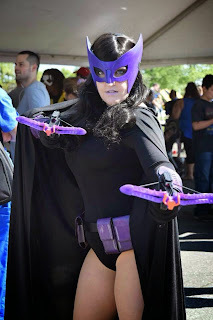 I mentioned it above, the cosplay I began losing weight for, and it is, Injustice Hawkgirl. I've been in love with Hawkgirl since the Justice League cartoon because she's such a powerful female character. I really love her Injustice outfit because I have a strong love for gritty looking designs. So, here's hoping that I will have her done for NC Comicon 2015! 9) Has their ever been an outfit you just did not like wearing? And if so, why? Lucy Heartfilia was the cosplay I got happily and then disliked quickly. It was before my confidence got better and the skirt was way too tight and the top was way too big and it was just a mess. 10) Do you have a credo you live by? If you don't think you should cosplay it, then you probably should. 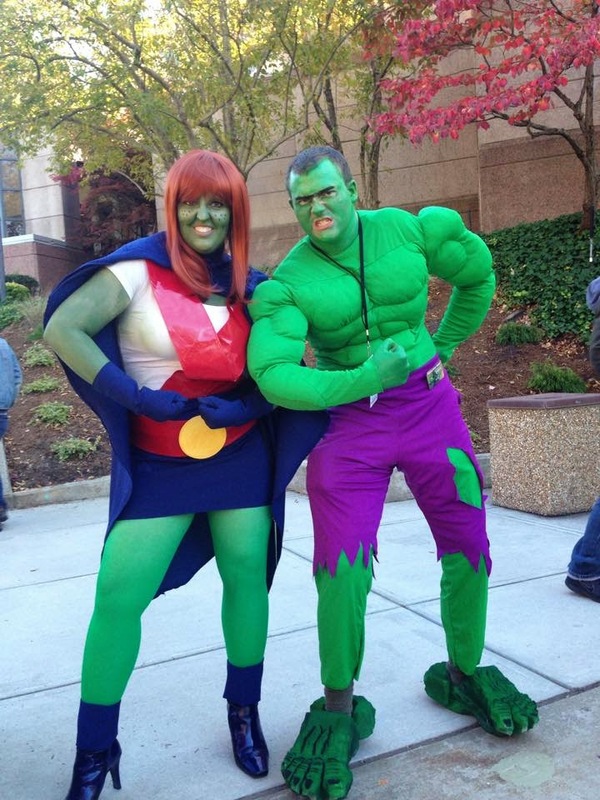 Anyone can cosplay and do it well. If you're passionate about it, then you follow your heart and you cosplay! And on that note, I'd like to thank Ginger for telling us about her life as a cosplayer, before directing you towards her great facebook page.